Fancy a trip to Venice in Edinburgh? Join Arlecchino as he takes on two jobs and two masters. Midsummer madness rages! 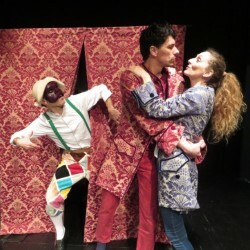 Master number one: Beatrice, disguised as a man, searches for her beloved Florindo and she hires Arlecchino. Master number two: Florindo, accused of murdering Beatrice's brother, escapes to Venice and he hires Arlecchino. True love or tragedy? At his wit's end and starving, will Arlecchino ever get his dinner? Three versatile actors, nine roles! Physical storytelling with masks, puppets and music bring Venice to life, blending tradition and innovation.